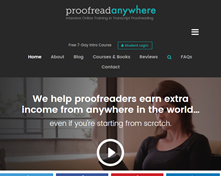 Proofread Anywhere Reviews – Legit or Scam? Proofread Anywhere is also now the online home of Caitlin Pyle’s training course, Transcript Proofreading: Theory and Practice™, which is intended to help people with all the training they need to become a professional proofreader. Though Caitlin says that becoming a proofreader won’t make anyone rich, she says it is an excellent way to earn side income or to even earn a full time income if you are willing to work hard enough. Caitlin Pyle says that before she created her training course, there really wasn’t any real, fully comprehensive proofreading course available online. She wanted to change this, and create a course that didn’t just check the boxes on the skills that proofreaders needed, but that truly prepared people for what it is like to work in the proofreading industry. Their course covers all important topics, from “formatting and preferences to punctuation and parentheticals” so that their graduates are absolutely as prepared for the reality of working in proofreading as they can be. Proofread Anywhere says that they actually don’t believe that professional proofreading is cut out for everyone, so before you sign up for their paid course they ask all their students to take their seven day free course. This free course provides prospective students with a new short lesson each day so they can see whether or not proofreading is something they enjoy and can do. If you decide to move forward with their course, you will then sign up for their 30 Day Jumpstart for $197. Again, the website says they don’t even offer the option for their students to sign up for the entire course at one time, because if anything changes or you decide that this area of business just isn’t for you, Proofread Anywhere doesn’t want you to feel as though you are forced to continue or lose a huge investment. If you continue past the 30 Day Jumpstart you will move to their 60 Day NextSteps course, which is priced at $400, and once that is successfully completed, you can move on to The Rest of the Course at $300, for a total of $897 for the entire course. Average Rating for " Proofread Anywhere Reviews " is 3.7 out of 5 based on 63 reviews. Wow I researched her course and thought, nope she's nuts. Saw her You Tube videos and she is not all there. Her voice on the hour long video to push this proof reading class was so annoying. Valley girl for sure. Glad I didn't spend my hard earned money. Better to go to an accredited college and learn what you need to do. Total waste of your money. The entire company is falling apart because Caitlin Pyle (Caitlin Johanna) is off her rocker. Most of the company has already quit and all of my classmates keep dropping out because she’s totally insane. All the 5 star reviews are fake and posted by her and her friends. Note: She sells the dream of making millions from proof reading when in reality she made money tricking people into buying her worthless course. I was duped into signing up. Don’t make the same mistake I did. Stay far away from Caitlin Johanna Pyle professionally and personally! Thanks for this. I figured this was the case when I watched her stupid one hour webinar. Most of it was a bunch of motivational hype, and it was too long, and then at the end, 20 minutes of sales hype to get you to sign up for the course. (which I didn't do) That story about getting fired by three bosses, etc., is probably BS. I too am a 'graduate' of the General course and totally concur with Rosanne and the other negative comments on here. Rather than add to them ad nauseam, my particular beef is the lack of clarity around the use of iPads or PCs and the software to use for best results. I am a long time Mac user (35 years) and was really saddened to see people on the FB forums asking questions about what to buy and not getting any input from Proofread Anywhere "support staff". Particularly questions from people struggling to pay for the course and then being led to believe that an iPad was required for proofreading when they had a perfectly adequate PC. There is no input whatsoever to guide people to appropriate sources or even anything to put their minds at rest. Quite heartbreaking to hear people struggling with an unnecessary financial fear. I am in the fortunate position to have done the course as a hobby/interest and possible sideline in my retirement and don't need to be proofreading for a living. I really feel sorry for the people who are struggling to make ends meet and trying to up-skill themselves to bring in a bit extra for their families and all that seems to be happening is the only one really benefiting financially is Johanna. This has been my first experience of the American 'business/money-making' environment and I am appalled at the cynicism displayed and the apparent acceptance of it by the students who defend her. They apparently don't know any better! And don't get me started on the religious zealotry! Has anyone found an alternative course for general and transcript proofreading? Any suggestions on legit courses to take would be greatly appreciated. There’s one called Art of Proofreading and it teaches both proofreading and editing. Plus you have the option of trying it for 7 days and if you don’t like it you get your money refunded. But it has to be cancelled within 7 days. Check it out. I don't think bollshtreader has taken the paid course. There are quizzes with the paid course, and you have to pass them to move to the next level. So the PA course itself is actually very, very good. But as far as actually working as a transcript proofreader, there are many, many caveats. -- The court reporting environment is *very* insular and cliquish. It's hard to break in and actually keep clients. -- Some reporters hold a grudge against Caitlin Pyle because she created PA and made over a million dollars teaching people how to proofread after getting fired from a court reporting agency (though it wasn't because she lacked skill). So some reporters won't use a PA proofreader, and some reporters are continually badmouthing PA and PDF transcript proofreading. -- A lot of people who want to do this job are introverts. And if you're an introvert, you're probably going to struggle with marketing. -- The social media outlets for finding court reporting clients are saturated now with proofreaders looking for work. Other ways of marketing require more work (not that that's a bad thing), but those methods are arguably less effective. -- You spend over $1,200 to go through this course and learn how to proofread properly for court reporters. You kill yourself learning the rules, and while you are told that court reporters' "preferences" are a factor, you don't realize until you get out there and try to do actual work that some reporters actually want you to ignore good English and just do it "their way." That's very hard to do over and over again when you're a person who cares about quality. -- Stories about "bad proofreaders" are also rampant out there. While those stories aren't necessarily fair because court reporters' preferences can vary so widely, bad word of mouth can *kill* your career fairly easily. -- A LOT of reporters are trying to save money by having you do a scopist's (editor's) work at a proofreader's rate. It's very, very hard to make decent money that way. And badly scoped transcripts are LEGION out there. -- If you don't work weekends, it may affect your ability to find regular clients. -- Of course, there are some success stories out there. But I've noticed that quite a few transcript proofreaders have quietly walked away from this line of work to look for other ways to earn money as a freelancer. So the (paid) Proofread Anywhere course -- it's great. Actually working as a transcript proofreader -- not so much. Count me among the duped. I'm chalking this one up to learning a lesson. The woman is completely off her rocker. Does anyone know if there is a connection between her course and transcribeanywhere.com? It appears that Pyle's course is a complete ripoff of Janet Shaughnessy's course. I wish I would have seen that one earlier, before spending the money. Still having doubts? Read this. She's since taken down the "brilliant and hilarious" letter but I did get a chance to read it. After watching her youtube videos. WOW. If you haven't gotten a chance.... watch the videos she filmed on the bridge in Austin. WOW. As far as the course, despite her going off her rocker, it's NOT worth it. Listen to the other reviews in this thread and SAVE YOUR MONEY. I am so glad that I found this thread. For the longest time, I could not find any "negative" reviews. That should have been a red flag! I am a "graduate" and feel like I was misled about finding work. I do not want to prostitute myself out on social media to find work. Heck, I don't even have a Facebook account and have no intentions to. It just feels so wrong and sleazy to promote myself in such a way, almost like working an MLM. I do feel like I learned a lot and don't regret that part, but now I feel I will not be able to apply that knowledge. Through my efforts, I was only able to obtain one client. She needed a fill-in for her regular scopist who was going in to have surgery. I can't even believe she published her letter for the public to see. It was extremely unprofessional. As for the Transcribe Anywhere course, I am enrolled and am slowly working on it. I feel that it is legit and am learning from it. I do wish that the course taught the basics of working with MS Word and MS Excel, but I am learning that on Udemy.com. There are plenty of companies that will hire you as a contractor to transcribe for them. While you can promote your services to others, it isn't your only option. There is also this training course https://www.gtbootcamp.com taught by Ginger Schell. I am not enrolled but wish that I knew about her before enrolling in the Transcribe Anywhere. Her course is for general transcription only. Thank you for your honest review. I KNEW there was something wonky when I read her "brilliant and hilarious letter". Then I started looking further into everything and reading her posts on Facebook. The first thing that came to my mind my "schizophrenic". Not that it's one's own fault if they have that...but the professionalism, or lack thereof, as a result of *any* mental illness is a big turn off. The Proofread Anywhere company is a joke. I hope new people who are signing up quickly read some of the FB posts by Caitlin Pyle (now changed her identity to “Caitlin Johanna”) so they can immediately have the charges reversed by their credit card company. Her posts are related to her marital problems, informing everyone about her sexually transmitted diseases, disparaging her husband, asking people in the Proofread Anywere course to come to court and stand up for her so she doesn’t lose the company, and posting the transcript of her recent day in court. Just reading that transcript alone will let you see what an inept, narcisstic, belligerant, unprofessional, dillusional, religious zealot she is. I’m sure the judge was very amused by her absurdity. I will NEVER tell people I took this course. I could probably overlook her insanity if the course was top-notch, but it certainly is not. There is zero support from anyone at Proofread Anywhere. Give them your money and good luck on your own. If it weren’t for the great people supporting one another in some of the FB groups, you may as well just open a window and throw your money to the wind. An expensive lesson. As other posters have noted, if you say anything negative, the “leader” of the Proofread Anywhere program will call you names, say you’re a loser and she doesn’t even want you in the program. And those are just the nice comments. She contributes nothing to the courses – it’s all about the self-proclaimed beautiful, intelligent,and all-knowing Caitlin and how she made her millions. I’m done with all the nonsense – it was fun reading her posts for entertainment when I needed a break – but it’s so pathetic and bizarre and just a reminder of how I wasted my money. I'm so glad to see your comment!! I literally thought I was the only person on the planet that was thinking that she has completely lost her mind. I got the most BIZARRE email from her a few weeks ago (the "I don't give a F" email) and immediately started researching. I could go on forever typing my thoughts but just to add to your comment...... have you seen her youtube videos?!?! On the bridge in Austin?? Unreal. No wonder she was committed. She has lost it. Seriously. Her posts on medium are amusing as well. She has the biggest inflated ego I've EVER seen and only cares about money while at the same time appearing like she doesn't care about money. She is PURE entertainment for me now...... and it makes me so happy I never went through with it and spent the money on her course. How is no one else talking about this?!?! All these courses- blogging academies, how to declutter your house, productivity bundles- all are outrageously priced and put out by quite a tight network of “ friends”. No names mentioned; you’ve probably seen them around. I am in the middle of Caitlin's transcript course. With all of the drama she has been posting in the last few months, people are dropping like flies. She says she doesn't care, calls people names, then says everyone else is being "unkind" to her and "throwing knives at her face." It's all craziness and embarrassing to look at; not professional at all. I'm about 1/3 through Phon's course now, and I cannot believe how much I'm learning every day. It has made me want to just give up on the Proofread Anywhere and let my money go to experience. And, the Art of Proofreading course costs a lot less. You're not always being marketed to, either. I hope I didn't make any grammatical errors here because Caitlin (as usual) will just answer with proofreading corrections instead of real answers. Hello there, I am still reeling from the waste of money, and the incredible disappointment in the course. Gosh, I am an experienced copy editor and proofreader having lived and worked in the UK, South Africa, and now Sydney and was gobsmacked at the essay exercises. There were so many errors and inconsistencies and I felt disgusted and then shocked by her meltdown. I am divorced and was hoping to find more proofreading work in the States but having lost my money, hmm, will stick closer to home and persevere. Gosh, I wish she would reimburse me as she seems to take delight in promoting her success and wealth. Thank you.